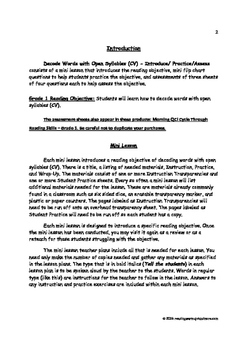 Decode Words with Open Syllables (CV) - Introduce/ Practice/Assess consists of a mini lesson that introduces the reading objective, mini flip chart questions to help students practice the objective, and assessments of three sheets of four questions each to help assess the objective. 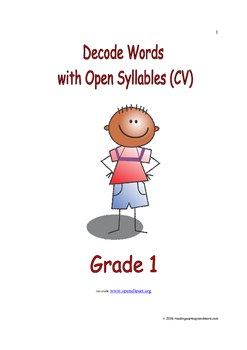 Grade 1 Reading Objective: Students will learn how to decode words with open syllables (CV). The assessment sheets also appear in these products: Morning QC! Cycle Through Reading Skills – Grade 1. Be careful not to duplicate your purchases. Each mini lesson introduces a reading objective of decoding words with open syllables (CV). There is a title, a listing of needed materials, Instruction, Practice, and Wrap-Up. The materials consist of one or more Instruction Transparencies and one or more Student Practice sheets. Every so often a mini lesson will list additional materials needed for the lesson. These are materials already commonly found in a classroom such as six sided dice, an erasable transparency marker, and plastic or paper counters. The pages labeled as Instruction Transparencies will need to be run off onto an overhead transparency sheet. The pages labeled as Student Practice will need to be run off so each student has a copy. Each mini lesson is designed to introduce a specific reading objective. Once the mini lesson has been conducted, you may visit it again as a review or as a reteach for those students struggling with the objective. The mini lesson teacher plans include all that is needed for each lesson. You need only make the number of copies needed and gather any materials as specified in the lesson plans. The type that is in bold italics (Tell the students) in each lesson plan is to be spoken aloud by the teacher to the students. Words in regular type (like this) are instructions for the teacher to follow in the lesson. Answers to any instruction and practice exercises are included within each mini lesson. The mini flip charts are to be used as practice of the reading objective. Each flip chart page includes the two questions and answer choices, if applicable. There are 16 questions per objective. An answer key is also provided. The teacher holds the flip chart. Students can be arranged as a whole class, small group, or individually. The teacher reads a question from the flip chart out loud to the students. For some questions, the teacher shows the flip chart to the students so that they can see the answer choices. For other questions, the teacher reads the answer choices out loud to the students. The students can announce their answer, write it down on a marker board or paper, whisper it to a partner, or come up and point to it on the flip chart. There are two flip chart pages on each sheet. You will need to cut each piece of paper down the middle and put the flip chart cards in order. Once the flip chart cards have been cut, you may punch a hole in the top left corner and attach a loose leaf metal ring that opens and closes. This will allow you to flip the cards over. You may choose to make the copies on regular paper or on heavier cardstock. You may also choose to laminate each flip chart card. This will help the flip charts last much longer. The mini flip charts are great for reviewing and reinforcing the objective while students have a few extra minutes during the school day. The flip charts could be used with students while waiting in line for lunch or an assembly. These flip charts can be used while students are taking turns using the restroom and are waiting for everyone to finish. They are ideal for the end of the day while waiting for the clock to tick off the minutes before dismissal. You can take them with you wherever you go because they are so portable. There are three assessment sheets with four questions on each sheet. The four questions assess the reading objective introduced in the mini lesson and practiced with the mini flip charts. You may use the assessment sheets at any time. An answer sheet is provided. 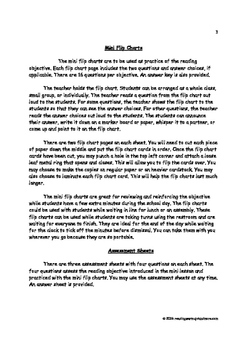 Typically, the assessment sheets are used after the students have been through the mini lesson and have had a chance to practice the objective with the mini flip charts. Since there are three assessment sheets, you may choose to use only one sheet to assess and use the other two as additional practice or even use later to review the students’ knowledge and mastery of the reading objective.